Every good musician knows about the importance of having the right guitar pedal to distort their sound. It gives you access to a much wider range of tunes and can significantly increase the quality of your performance. Most of the times you can buy this accessory online or in a music shop, as we’ve already discussed in our recent article, but some musicians prefer to build their own, be it for budget reasons or for making sure that the effect is precisely the one that they were searching for. Our guide here is aimed at showing less experienced guitar players the steps they need to go through to build their effect pedal from scratch and enjoy what it brings to the table. Among the various reasons why you would want to build your pedal instead of just buying one, we would count the price as a primary factor. 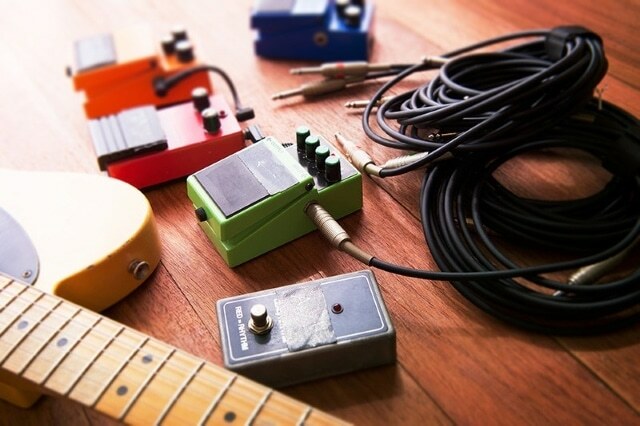 As we all know, guitar pedals can be quite expensive, and if you can’t afford to spend your money on that type of equipment, you might prefer to take the more difficult road and build one. Unlike what you might have heard, it’s actually not that hard to build one from scratch. It only requires some basic electronics knowledge, and you should be able to obtain most of the effects that you desire. Another reason why you might want to go through this process would be because the product you are looking for is currently out of production, or is difficult to find in your area. Worry not, because we are here to walk you through the basics of what you will need for this piece and how to put it all together in no time. For all other information that you may need we strongly encourage you to search online since despite common beliefs you can find reliable advice on the Internet. Every great electrician has their trusted set of tools. 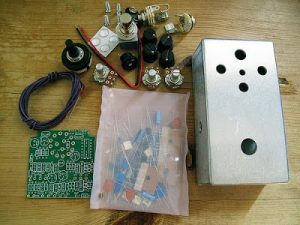 What you will need to build a guitar pedal from scratch is a basic set, nothing too fancy. Start with some precision screwdrivers, a craft knife, and an adjustable wrench. Most of these items you can get if you go into a DIY retailer shop and buy a straightforward and inexpensive kit. Or you can pick them out separately, whatever you prefer. Then, you need some special tools that are required for pedal building. A soldering iron, wire cutters, reverse-action tweezers, and a multimeter among others should also be included in your kit. You might feel overwhelmed already, but after we go through the actual process, you’ll understand more about the practical use of these products. Although it may seem like the number of elements involved is difficult to comprehend, that’s not the case. Most of the times you can narrow it down to a couple of types that are easy to identify and continue from there. The first thing you will need is a couple of resistors, which are passive components with linear controlling function. Their role is to give other parts the right operating conditions. What’s important to know about them is that they are color coded to indicate their respective resistance. Next, you will need capacitors, another passive component that comes in two types: radial and axial. They can be polarized, which will determine the way they should be attached. As a general rule, it’s essential to know that the anode will be longer than the cathode. Potentiometers or pots are the controls of the pedal. While the rheostat is used to control resistance to the current, they are used to allow the signal from pins one and three to pass on to pin number two in a controlled dosage. The polarized components that allow current to flow in one predetermined direction are called diodes. You will need those to rectify waveforms, but they are sensitive to heat, so you need to work with extra care when handling them. Last but not least, transistors are used as amplifiers and are generally made of silicon. If you feel like this is a lot of information to take in, focus on remembering which components are polarized and then follow the instructions. 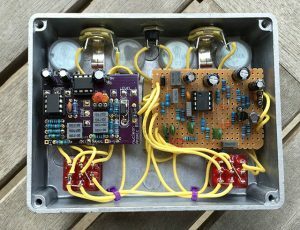 For building an actual pedal, you need to start small. Don’t forget to print the layout of the electric circuit beforehand. Otherwise, you’ll be totally clueless as to how the components go together. You will need a clean copper board to transfer the circuit onto. It shouldn’t take too long if you use an iron. It will help if you print the circuit on photographic paper. Next step is using a plastic container and some fluid to etch the copper and reveal the circuit. Ammonium persulfate is a reasonable and affordable alternative that you can quickly get ahold of. Our advice would be to remain careful through this step because working with dangerous fluids can severely damage your skin if you’re not wearing protective gloves. After you remove the etchant, you need to drill the holes that the components will go in. Next, you need to solder the actual parts, using a soldering iron after you put them in their places. The wiring is the part where you need to be careful not to make mistakes. You can use offboard wiring layouts for detailed help on how to carry out this step. Make sure you give the pedal a test before you put it in a case because it’s going to be a lot harder to disassemble it after that’s done. This step is relatively simple, but make sure you install a status LED before actually closing it. If after the process is done, you find some things are not working, there are a couple of solutions you can try. For example, the first thing that you should check is the wiring, because that’s where it’s easy to make mistakes. Next, make sure there are no bad solder joints and that they’re all clean. Checking the circuit with a multimeter wouldn’t hurt either.